On Friday May 9th, 2014, Bruges’ annual funfair ‘De Meifoor’ starts its 814th edition. About a hundred attractions occupy Bruges’ inner city markets for a couple of weeks (till June 1st). For the first time, there will be no attraction with live ponies on the Bruges Meifoor, according to reports in Het Nieuwsblad and Het Laatste Nieuws. The Nieuwsblad captions “children will not be able to ‘enjoy’ a ride on real horses”. However, for the ponies, there is no enjoyment in it. In this funfair attraction, ponies walk little circles in a small arena for hours and hours on end. For a couple of euros, children can ride along on the ponies’ back for a couple of circles. The ponies have to endure the deafening music and bright scattering lights from surrounding fair attractions. Animal rights organisations have often protested against these pony attractions in several Belgian cities, and luckily, more and more cities are banning this attraction on their annual city funfairs. But the abscence of the pony attraction on the 2014 Meifoor in Bruges is not due to the city council of Bruges having banned this attraction. The owner of the attraction even had a permit till 2016 (according to info provided to us by city officials). 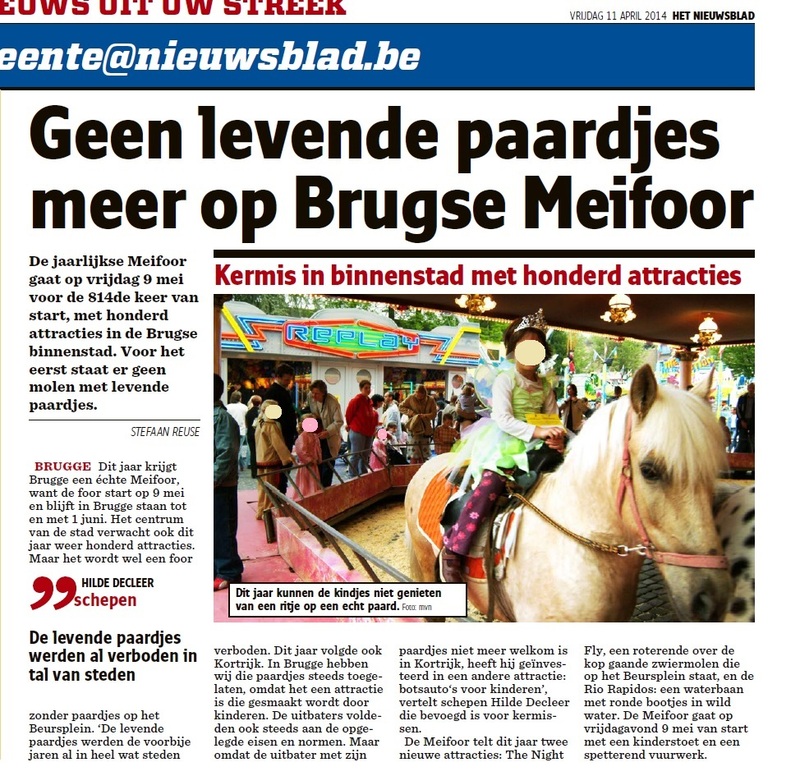 There will be no ponies on Bruges’ Meifoor because the owner of the attraction has quitted the attraction. Due to to the fact that nearby city of Kortrijk (Courtray) has banned his pony carrousel, he apparently found it no longer worthwhile and invested in another attraction: dodgem cars for children. We hope pony carroussels on fun fairs will soon be a thing of the past in all Belgian cities. Preferably, it should not be up to the city councils to allow or ban the attraction, but national legislation should be installed to ban this attraction, in which animal are exploited for the amusement of children and parents. I agree, national legislation should protect these creatures. I hope that these fair ponies were compassionately retired.